Great Business After Hours hosted by Elevate! Global Credit Union just opened a new Home Loan branch on Gage in Kennewick. At a time when banks are closing, it is nice to see a bank that is expanding. Global Credit Union’s history, going back to its founding in 1954 to serve miliitary and civilian personnel at Fairchild Air Force Base in Spokane. The entire story can be found on their web site. It was standing-room only in the offices when it came time to cut the ribbon. Jack Fallis, the CEO, and a number of other executives from the home office in Spokane were on hand to cut the ribbon with Lori Mattson, CEO of the Tri-City Chamber of Commerce, and Sharon Brown, Mayor Pro-Tem of the City of Kennewick. The food was catered by Country Gentleman and was fantastic as usual. Wine and beer were also provided. I must say that I enjoyed the meat balls too much and may not need dinner tonight. It was fun to talk with various folks from the Credit Union as well as talk with others in attendance. Chamber events are always a great place to network. See you at the next one? 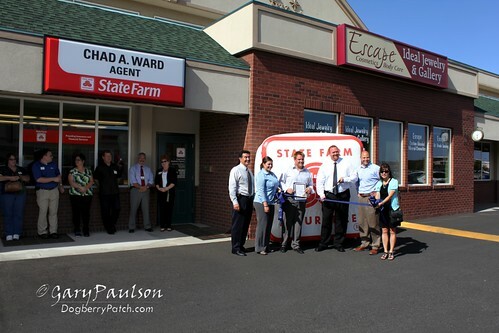 The ribbon cutting had a good turnout from the chamber as well as representatives from the State Farm District Office and Mayor Pro-Tem Sharon Brown read the Mayor’s proclamation making Chad’s office ‘Business of the Day’.